In the ripe countryside of Kyongju (경주), nestled in a valley below Sokkuram Grotto (석굴암), a UNESCO World Heritage Site, is a small community of farmers who have opened their doors to weary travelers. 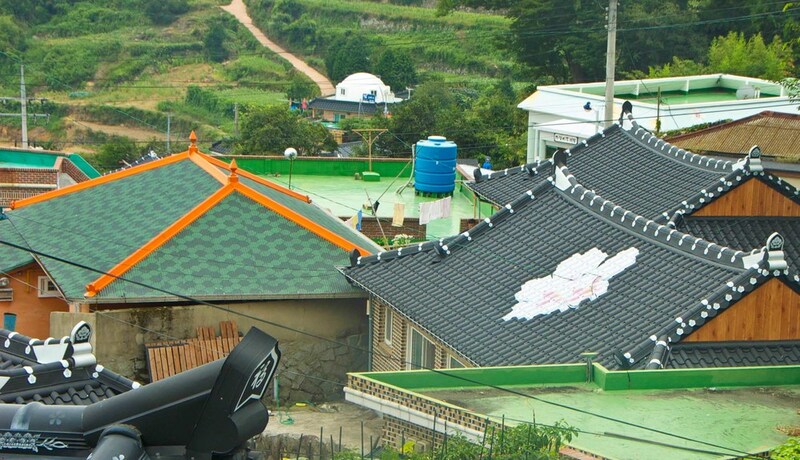 A growing trend in Korea, a homestay (also called "minbak" 민박) provides farmers with additional income while offering a peaceful, authentic rural refuge for urbanites seeking quiet. Personally, I think the idea is brilliant! We arrived at Chodangbang minbak (초당방 한옥 민박) in the pitch black of night, so when I opened the hanok* door at the break of dawn, I was astonished by the fertile beauty enveloping our homestay. A mist was rising from dew-laden plants, low grey clouds were moving off into the distance, and the yard was saturated with color. The hanok looks over a small sitting yard with a stream-fed pond and stone bench next to a gnarled pine tree. The pond water travels through a small gully to a water wheel that powers an underground storage room shaded by a canopy of cucumbers and squash dangling from an overhead net. Walking down a set of stone stairs, a pebbled terrace is covered with traditional clay pots of varying sizes. Beyond the clay pots is the lush, green garden, stretching into the distance maybe two acres. To the left of the patio is a large, covered community shelter, with eating tables, BBQ area, and a large kitchen. *"Hanok" (한옥) is the name of the traditional residence style of a yangbang, or scholar. The peasant class lived in straw homes called cho-ga-jeep (초가집). At Chodangbang, the hanok is original; the owner's family has lived at Chodangbang for generations. The hanok is divided into individual guest rooms, each with a small bathroom, kitchen, and clean bedding. Guests sleep on the heated floor (which is far more comfortable than you might imagine). Not all farm homestays offer hanoks. Other minbak in the Beomgok-ri Village area and other rural villages are more modern pension-style rooms. Chodangbang is exemplary of the Ministry of Agriculture, Food, Forestry and Fisheries (MIFAFF) rural affairs program aimed at helping farmers and rural villagers boost economic productivity through activities such as tourism and fermentation processing. The Rural-20 Tour program revitalizes rural villages and rewards them for preserving culture and beauty. 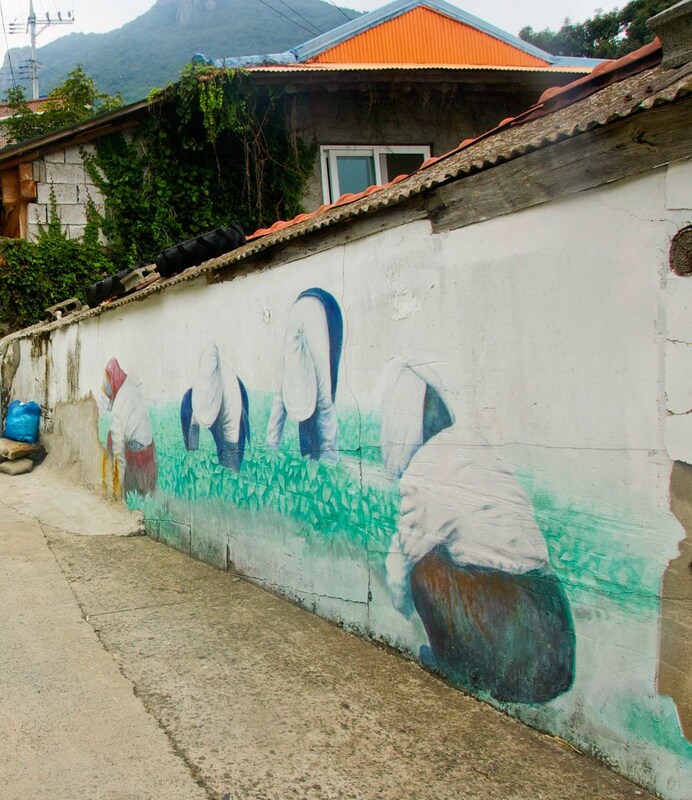 Kachon Village in Namhae (가천마을, 남해) is one example. Here are "before" (2002) and "after" (2012) photos of the revitalization effort.